You’re doing the right thing, checking out traffic ticket lawyers. You likely realize if things aren’t handled right, there can be costly, long-term consequences to your insurance premiums and even your driver license points. And a lot of those opinions are predicated on urban legend, wishful thinking, speculative information from a Google search, and no small amount of, “You should do this, I heard it works” advice from well-meaning friends. Do I Need a Lawyer for a Ticket? 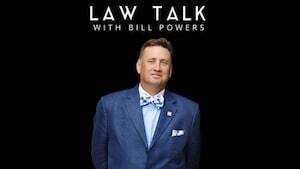 There’s nothing in the NC criminal or traffic laws that require you to retain legal representation. Frankly, it may seem easy to go in, talk to the prosecutor, and handle a ticket by yourself. Things are different when you go to court. It can be a bit discombobulating, with people standing around, deputies barking out instructions to all kinds of different people facing different charges, some of which may include traffic citations. They confuse legal options, also thinking a PJC is automatic. Heck, some people seem to think a PJC is the same as a dismissal. It’s not. It’s not necessarily as easy as it may look. Clearly, you can appearpro se in court. That means you’ll be speaking for yourself. But you also need to know this: It’s against the law for prosecutors and judges to give you legal advice. Legal advice includes explaining whether you’ll receive insurance points or motor vehicle points. It violates the cannons of ethics for an ADA or judge to tell you what’s best for you and your individual circumstances. Courts do not necessarily work like the rest of the working world or what you’re used to. We’ve all become accustomed to living in a world focused on individual needs, preferences, and comfortable surroundings. You’re not really a customer in the legal system. You may not like how things work in court or think it’s anything but what you define as “fair.” You’re not in control, the Judge is. That can be a bit of a culture shock for some people. Here’s an example. You’re probably pretty used to carrying around your cell phone and having it to immediately access the internet. Some studies indicate that certain age-groups become physically uncomfortable if they’re separated from their phone for even short periods of time. Next time you get a chance, take a look around when a bunch of people are standing in line, waiting for something. Everyone will be on their phone, checking texts, social media, and maybe even playing a game. Know this: In some judicial districts, cell phones are NOT ALLOWED inside the courthouse… period. If you get a DWI in Lincoln County or were arrested for criminal charges in Greensboro, go ahead and leave your phone in the car. That’s true too in Iredell County, both in Statesville and Mooresville. North Carolina Speeding Tickets – Can My License be Suspended? Getting a speeding ticket in North Carolina can potentially have significant negative consequences, especially if you already have other violations on your driving record. 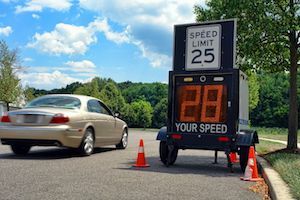 For speeding ticket, a lot depends on how much above the posted speed limit you were driving when clocked (radar, lidar, VASCAR, after a visual estimate of the speed) by a certified police officer. Speeding might also lead to some drivers temporarily losing their licenses. 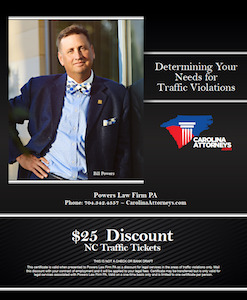 In North Carolina, you can be assigned points if convicted of certain traffic violations. 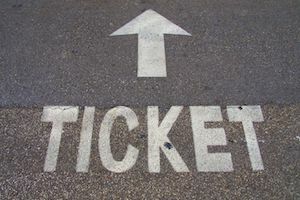 Point values differ for various offenses, with some infractions (or citations) resulting in no points or very few points, with other tickets carrying big-time point values. Some traffic tickets might result in only two or three points, while more serious violations (like passing a school bus in NC) can potentially cause five or more points to be added to your record. DWI in NC uses up all your points at once, even for first offense DUI. Your license will be revoked if you’re convicted. You may be eligible for some sort of limited driving privilege, but the point is, your insurance rates are affected. By the way, it’s important to understand, there is a difference between insurance points in North Carolina and motor vehicle points issued by NCDMV through the SDIP, which stands for the Safe Driver Incentive Plan. If you are issued 12 or more points in the span of three years by the Division of Motor Vehicles, your license could potentially be suspended for up to 60 days. If you are convicted of even more violations, you could also possibly face additional suspensions of six and 12 months, depending on your driving history, when tickets take place, considering the results of being convicted or pleading guilty to traffic tickets. In extreme cases, you could potentially even have your license permanently revoked. Each case is different, so it’s important to speak with an experienced traffic lawyer about the unique aspects of your case and your driver license. Do NOT rely on what may apply to someone else. Understanding the implications of at-fault accidents, traffic tickets, insurance points, motor vehicle points, and household policy exceptions is complicated in North Carolina. Seek legal advice immediately. Getting a speeding ticket in North Carolina can also cause your insurance rates to rise. Insurance companies follow a similar point system to that used by the DMV to assess the severity of a given offense and possibly assign points accordingly. How insurance points are set in North Carolina is set by the Legislature. Of course, that’s true too of motor vehicle points assigned by NCDMV. While that may be called a “surcharge” under the traffic laws, what it really means is money out of your pocket. It’s also important to understand, even if your rates are not technically increased, insurance companies can refuse to continue premium discounts. Frankly, that’s just a clever way to raise your rates, whatever the carriers want to call it. Raising rates vs discontinuing discounts based on a safe driving record result in the same thing: increased insurance premiums. The North Carolina DMV’s point system is complicated and be difficult to understand without the help of an experienced North Carolina traffic law attorney. We’re here to help, but more importantly, we’re here to serve as your advocate in court. A lot of traffic tickets can be “waived,” which means as your attorney, we may be able to appear on your behalf in court. Charlotte has a somewhat unique administrative court process, where courtroom 1130 is used to clear literally thousands of traffic tickets in Mecklenburg County each year. Give us a ring. We’re more than willing to provide a free consultation and explain the best-case and worst-case scenarios. We’ll have a lot of questions for you, primarily involving your driving history and incidents of car accidents, relative to your record. Call now. The consultation is free, it’s also confidential.